The following advertisements caught my eye: and I started wondering if it makes sense to have a state when one business can grow by capitalizing on competition of another business . 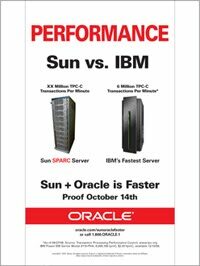 Sun and Oracle in their joint advertisements have started to take on IBM directly. The pictures of the advertisement show the same. The question is, can telecom companies, use the opportunity to their benefit?? The growth of the telecom market has been exponential– and we all are aware of it. But standing today, the telecom companies are facing steep challenges managing networks, vs costs vs subscriber demands cs Competition– where Competition is driving business crazy. Consolidation in business is being viewed as one of the modes of operation in a hyper competitive telecom markets. New operators who have spectrum but not a significant customer base can merge operations in a revenue share model with existing and large operators who have large customer bases and thus struggling with spectrum. How to enjoy and reap benefits when the hardware vendors compete? In the coming years, imagine the telecom companies joining hands in a revenue-share brotherhood to provide a ‘global infrastructural support’ for all forms of communication systems in a B2B business. Companies like Sun, HP, IBM compete within themselves for providing the hardware support in the infrastructure. Thus, just as the revenue for telecom companies are dwindling due to massive competition, the situation could have the hardware companies fight among themselves to get the share of the pie in the infrastructure. Companies like Google become the service providers in a B2C business and deal with the consumer bases, while telecom companies enjoy being the complete integration backbone. Sounds interesting and theoretical. Business consolidation for sustainability is not a new concept. But the question here is- would telecom companies become the ‘global brotherhood’ or choose to draw arms to kill competition thus depleting their own resources in wake of getting market share? This is a situation, the answer to which only time will reveal. 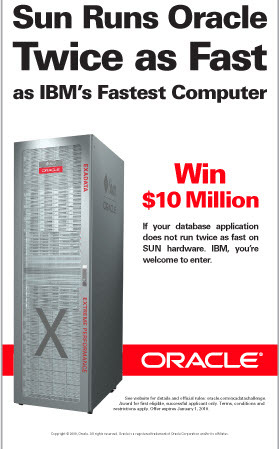 This entry was posted in Business, IBM, Oracle, Sun, telecom. Bookmark the permalink.